These terms & conditions apply whether a contract has been made verbally or in writing. The hirer is responsible for the actions and decisions of all passengers on board including and additional costs incurred in performing the contract whether or not they actually travel with the party. All rides are billed to the customer's credit card or corporate account numbers. Capital Limousine accepts the following cards: American Express, MasterCard, and Visa. A 20% service fees will be billed to all rides. Service is calculated on the base fare, stop time, wait time, and any holiday surcharges that will be added and itemized on the customer's billing statement. The following additional charges will be itemized on the customer's billing statement when applicable: two-way tolls, airport fees and? Cell phone usage. If any outstanding monies are due, Capital Limousine reserves the right to take the outstanding monies at anytime from the original credit card which the client paid with. Cancellation of sedans and SUVs with TWENTY-FOUR HOURS (24 HRS) NOTICE OR LESS from scheduled pick-up will result in a full charge equal to the base fare price of the trip plus the 20% service fees. Cancellation of stretch limousines with THREE DAYS (3 DAYS) NOTICE OR LESS from date of service will be charged the vehicle hourly minimum. Cancellation limousine party buses, vans/mini buses and coach buses with SEVEN DAYS (7 DAYS) NOTICE OR LESS from date of service will be charged the full contract amount. In cases of no existing contract, the vehicles? Hourly minimum will be charged. Cancellation of Prom and Wedding contracts with THIRTY DAYS (30 DAYS) NOTICE OR LESS from date of service will be charged the full contract amount. In cases of no existing contract, the vehicles? Hourly minimum will be charged. A 'no show' fee equal to the base fare price of the trip plus 20% service fees plus applicable wait time fee will be charged when the passenger fails to arrive at the designated location. To avoid a 'no show' fee call 1-800-900-4469 if you cannot locate your vehicle. In the event of an emergency or an action by the hirer to vary the agreed conditions, Capital Limousine Service may return all monies paid and without further liability cancel the contract. We do not supply alternative transport if the company cancels. Capital Limousine has standardized point-to-point rates that provide flat rate pricing for travel to and from most major cities and airports. Sedan rates for travel between locations in which a point-to-point rate does not exist will be billed at Capital Limousine's hourly rate. Customers are billed from the time the vehicle leaves the Capital Limousine facility until the time it returns to the Capital Limousine facility, with 3 hours minimum. Fractions of an hour are rounded to the next thirty minute interval. Twenty minutes of free waiting time given on all Domestic flights from the official posted arrival time. Forty minutes of free waiting time given on all International flights from the official posted arrival time. Additional waiting time will be calculated in increments 15 minutes at the vehicle's hourly rate. 20% service fees, tolls and parking are additional. Capital Limousine does not monitor private flights, therefore, wait time will be charged as incurred for any passenger arriving on a private plane that is delayed by more than 10 minutes. Capital Limousine does not monitor train schedules, therefore, wait time will be charged as incurred for any passenger arriving by train that is delayed by more than 10 minutes. Passenger requested stops on route during a point-to-point reservation will be charged $25.00 per stop for maximum of 5 minutes, and changes will revert to Capital Limousine's hourly rate after 5 minutes. Passenger requested stops off route for point-to-point reservations, additional charges will revert to Capital Limousine's hourly rate. All quotations are given subject to The Company having available a suitable vehicle at the time the hirer accepts the quotation. Quotations are valid for 7 days unless otherwise notified. The hirer cannot assume the use of the vehicle between outward & return journeys, nor that it will remain at the destination for the hirer’s use unless this has been agreed with Capital Limousine Service. 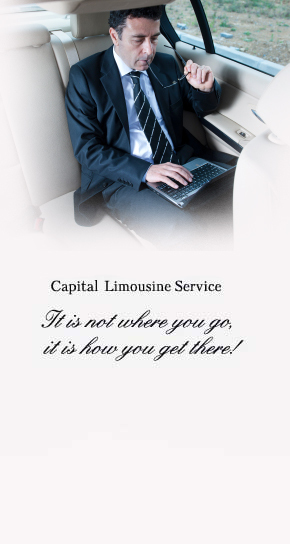 Capital Limousine Service reserves the right to levy additional charges for additional mileage or time to that agreed. The charges will be pro rata & in accordance with booking confirmation. The maximum numbers allowed on the vehicle is indicated on the vehicle. No standing passengers allowed. Drivers will not carry an extra passenger over the seating capacity. Will not be carried on any vehicle, unless if they are caged and guided. Capital Limousine Service may provide a larger vehicle than the size hired at no additional charge. Capital Limousine Service reserves the right to hire another Coach Operator or use our affiliate to cover the hire. The route used, unless the hirer has advised of a particular route or places to be passed en-route will be at the discretion of the company and/or the driver. The vehicle will depart at the times agreed by the hirer, and it’s the responsibility of the hirer to account for all passengers at those times. Capital Limousine Service will not accept liability for any losses incurred by the passengers who fail to follow instructions given by the hirer. Capital Limousine Service gives advice on journey times in good faith, but does not guarantee the completion of a journey at a specific time, and will NOT be liable. For circumstances beyond its control including but not limited to weather, road conditions and breakdowns. The hours of operation of the driver are regulated by the law and the hirer accepts the responsibly of ensuring the hire keeps to the hours and times agreed by Capital Limousine Service. Neither the hirer nor any passengers shall delay or otherwise interrupt the journey in such a way that the driver is at risk of breaching regulations relating to drivers hours and duty time. If any breach is likely to occur the hirer will be responsible for any additional costs. All booked vehicles are subject to restrictions on carrying luggage for statutory safety reasons & the driver shall be the sole judge as to whether & to what extent passengers’ property is carried. Capital Limousine Service will not accept liability for any damage or loss of any property, which belongs to any passengers and is left on a vehicle. Any articles of found property recovered from a vehicle will be held at Capital Limousine Service offices from where the vehicle is based and may be collected from there. All hirers and individual passengers are recommended to obtain insurance for those items where, save for negligence, Capital Limousine Service’s liability is limited (such as delay or luggage). The driver is responsible for the safety of the vehicle. Any passengers whose conduct is in breach of statutory regulations will be removed on the driver’s authority. The hirer will be responsible for all damages caused to the vehicle by passengers during the hiring. Must be made within 7 days of the date of hire in writing: Call Capital Limousine Service for mailing address. No bill, poster or notice is to be displayed on any vehicle without prior consent of Capital Limousine Service. Under no circumstances may alcoholic drinks be carried on or consumed upon the vehicle without the express permission of the company in writing. All vehicles are non-smoking unless otherwise agreed by Capital Limousine Service. Absolutely no illegal drugs are to be stored or consumed in the neither passenger cabin nor trunks of the vehicles. There will be no exceptions extended to anyone any time. Capital Limousine Service reserves the right to pass on to the hirer any increase in the cost of gas or any other increased costs resulting from Government action. We reserve the right to charge a valeting charge for any soiling in our vehicles or damages made by the hirer. Orders are only accepted in that the Law of The United States of America shall apply to the contract arising from such an order, and to the determination of the rights and liabilities of the respective parties and in that no action or other proceedings shall be bought by either party in relation to such contract except in a Court of competent jurisdiction in The United States of America.